Sasha's Super Easy Top Pattern! I used a Round Collar on this top but you can also use the Peter Pan Collar available for download or just use lace with a nice "header" and that way you will not have to use facings. The only time I used the facings with this pattern was when I did not have a collar at all or when I didn't use lace on the armholes. I don't have a picture of the tops I made using the lace only, but will scan some in this weekend. This top makes up so fast and it is nice to sit and hand sew with your family if you want to make it by hand. 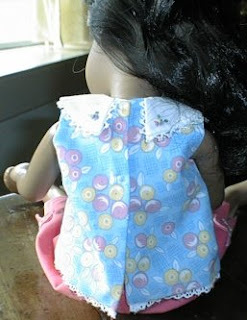 The picture below shows how sweet the back looks with a little embroidery added. On this top I didn't use facings since I lined the top with a soft batiste fabric. This top was actually cut from a square of fabric around 6". You can make it longer (which I did on the other tops that are unlined) or shorter. To lengthen or shorten, mark and inch down from the bottom of the armhole on each piece. Lengthen or make shorter from this mark. I just used little snaps, but you can use velcro or make buttonholes and find sweet buttons.